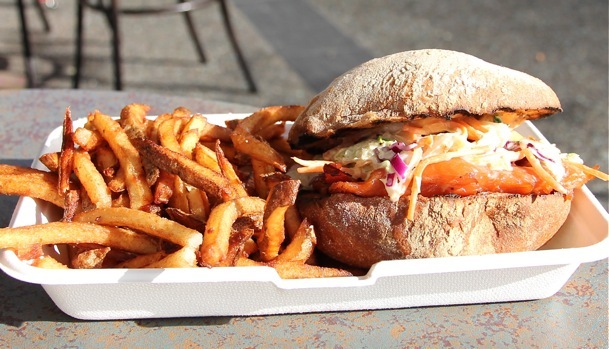 Looking for an amazing sandwich in downtown Vancouver? You’ve found it. Philly owns the cheese steak and NYC’s got the hot dog. If Vancouver were to nominate a breed of sandwich emblematic of our supernatural part of the world, Fresh Local Wild chefs Josh Wolfe (formerly at top seafood restaurant Coast) and Andy Fielding (a San Francisco street food veteran) have a promising contender: the Hot Smoked Northern Coho Sandwich ($10). Cured in the morning and smoked in-cart, the unbelievably moist, slightly sweet filet sits in a toasted whole wheat Portuguese bun coated with mild spicy mayo. Finished with a tong full of cool, homemade maple mustard coleslaw, I challenge all non-fish-lovers to give this responsibly harvested, Ocean Wise creation a shot — you’ll likely convert. Served with the emblematic sandwich are hand-cut fries. Also on sale at the fire-engine-red cart, whose owners you’ll likely hear before you see (they’re an enthusiastic bunch who are no doubt buoyed by their sea of fond patrons), are local goods (like chanterelle mushrooms) gathered in B.C.’s wild by Josh and Andy themselves.